Throughout Utah, air pollution is reaching alarmingly unhealthy levels. In fact, many areas along the Wasatch Front are currently out of compliance with portions of the Clean Air Act. Transportation is a major cause of the problem. Vehicle emissions are responsible for 50 percent of ground level ozone, meaning that each time we turn the key, we produce pollution which harms our health and the health of our children. The 2016 Clear the Air Challenge kicks off July 1st and is a great opportunity to explore alternative methods of transit to improve our air quality. For the past several years, local businesses and citizens have participated in reducing emissions. In 2015, we kept 646.5 tons of CO2 out of the air! This year our goal is even greater: eliminating 700 tons of CO2, in addition to the many other pollutants coming out of our tail pipes. How to Take the Challenge! Besides helping everyone breathe a little easier, participants are eligible to win prizes from the Challenge! 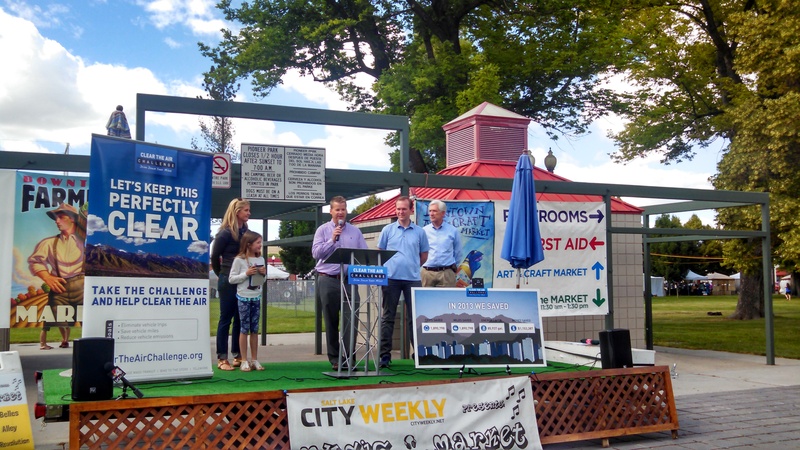 The challenge is open to all residents of Utah and offers many options for reducing trips in vehicles. Employee recognition of participation in the challenge. Don’t have an employer who’s participating? Individuals can sign up by tracking their trips and miles saved using the TravelWise Tracker. Individual participants compete against one another based on total miles saved for prizes and recognition. Miles can be updated throughout the entire month. Your information is used to determine the total emissions saved and, collectively, show us how little changes can make a big difference! Visit Ride UTA for fares and schedules. If you live in Salt Lake City, consider signing up for the HIVE pass, which saves you 50 percent! The city’s green bike program can help you get around downtown without a car, and new bike lanes make traveling on city streets safer and easier. Partner with a co-worker to alternate who drives to work each day. And thank you for helping make our city a cleaner, healthier place to live, work, and play!